By the time Allina Strauss arrives at the notorious Nazi baby factory called Hochland Home, she has little left to live for. SS officers have murdered everyone she loves and stolen her innocence. The only thing standing between Allina and death is a set of forged papers that hide a terrifying secret — her mother was Jewish, making her a half-blood Mischling. Traumatized and grieving, Allina’s despair grows as she becomes both participant and witness to Heinrich Himmler’s ruthless eugenics program. As a Hochland Home nurse, Allina helps tend hundreds of children, many of whom wind up in experimental hospitals, slated for testing and execution. To save them, Allina joins forces with an unlikely ally: Karl von Strassberg, an SS officer who works covertly for the resistance. Together, Allina and Karl find love and a passionate shared purpose amid the growing threat of war. Told from two distinct perspectives — Allina’s in the 1930s and her adult daughter, Katherine’s, 70 years later — Simple Acts of Grace is the story of how small acts of kindness and compassion triumphed over evil and saved lives. 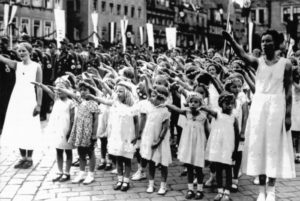 The book brings a little-known program into the spotlight and explores how the SS Lebensborn Project has affected generations of people in Europe.